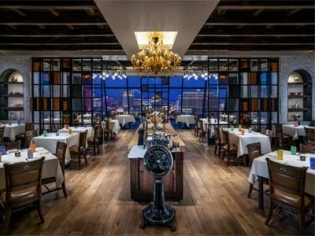 This unique restaurant has an equally unique location, the 56th floor of the Palms Tower with a grand view of the Las Vegas Strip and the surrounding mountains. Chef Vetri hails from Philadelphia and is widely known to be a prime mover and shaker in the art of Italian cuisine. Using local and specialty ingredients he crafts modern Italian cuisine with a taste of old Italy. With handcrafted pasta, rustic ingredients and innovative flavor combinations he is sure to win you over. Try the Bistecca Florentina, the Casoncelli Meat Filled Bergamascan Ravioli and the Pastrami Foie Gras. The Joe Beef X Vetri Cucina 6 course menu is $150 per person including a cookbook.